As for Fubuki she may not of had a figure at the start but the actually made her, which is reverse of these girls. Made protos and did nothing with em I really liked this design too. Fanart of Estoril to look at while we wait. Nothing's to be said for sure, but Konami is still at least interested in making at least a bit of profit from shinkis. The new artbook, statues, prize figs, and even new volume of the manga BS2036(which had been quiet for a WHILE) are enough evidence of this. Hopefully they're working on getting a new factory for new shinkis, but it's very possible they at least lost the prototypes for the bikers in the lost factory debacle. That is always a possibility. It is rather common to hear of factory molds getting damaged or destroyed during moves and floor shuffles and such. One can only hope they don't drop the entire line. There is a possibility that they're gearing up for a sudden gush of shinki releases yet no one outside of corporate knows what's going on. As said, time will tell. royalpain88 wrote: That is always a possibility. It is rather common to hear of factory molds getting damaged or destroyed during moves and floor shuffles and such. One can only hope they don't drop the entire line. There is a possibility that they're gearing up for a sudden gush of shinki releases yet no one outside of corporate knows what's going on. As said, time will tell. I remember that 20 year issue with the original wheeljack. Mold damaged "never releasing again" I held on to him until word came out of them gaining the templates to reproduce him. I have my piggybank waiting as many do at this point. Still no word on an official release, but some desperate fan has made (and seems to be selling) an Estoril garage kit Good luck actually snagging one of these off YJA though, gonna be expensive! Still wishing and hoping that Konami will release Estoril and Jill Rivers in the near future. 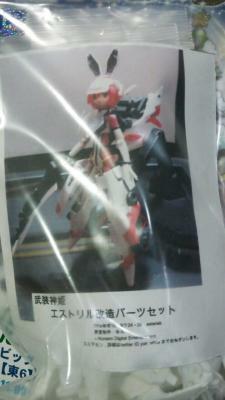 I don't want the Busou Shinki toy line to die just yet. I dont think any of us does. There's enough of an active second hand market with figs and garage kits, I'm hoping Konami just doesnt let it fade.